We are one the well-known suppliers & exporters of statues & sculptures, Fibreglass sculptures & statues, buddha statue, POP Ganesh sculpture, Meena ganesh SCulpture, Ganesh stone sculpture, Bal ganesha sculpture, handmade ganesha wood sculpture, shree krishna tree sculpture, Krishna Virat Swaroop Ashtadhatu Sculpture,Shivaji Maharaj Human Statue,Poet Rabindra Nath Tagore Sculpture,Golfer's Statue,Immitation Bronze Arthanari Statues,Brass Cow Statue With Krishna & Hanging Diyas, Sai Baba Marble God Statue, Shiv Parvati With Ganesh & Kartiken Statue ,Cat Iron Ganesh Ji & Laxmi Ji,Ruby Ganesh, Laxmi & Saraswati Ji and many more. The offered statues & sculpture is based on abstract concepts and themes for decorating home & offices. These statues & sculpture is very cost effective and affordable. Short on time? Let sculptures sellers contact you. 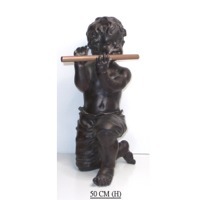 Hand made bronze sculpture with high quality. Artistic Art Forum Pvt. Ltd.
Fibre glass with coper finish. Cac Vietnam Joint Stock Co.
We mainly produce: Lacquer Vases, Lacquer Bows, lacquer Sculptures, Wall decor, Lacquer Painting, Photo Frames, Plates, Trays, Wooden ship and Mirrors, Furnitures, Gift items.... Our products are handmade lacquerwares from wood fibers(MDF), ceramics, rattan, bamboo, wood, resin... With a professional expert team, our items are produced bases on our own design. They are the new and unique products which combined between Vietnamese traditional craftsmanship and modern techniques and innovative design styles. We have over two thousand different models with over four hundred different colors. The principal types of color as Solid colour lacquer ( auto paint), White Mother of Pearl Lacquer, Pink Mother of Pearl Lacquer, Round Mother of Pearl Lacquer, Large Mother of Pearl Lacquer, Round Wooden inlay Lacquer, Square Wooden inlay Lacquer, Mixed Lacquer, Metallic Lacquer, Flower Metallic Lacquer....etc All products are handmade of MDF ( compressed wood ) which is wooden powder, chips...are mixed with glue and moulding under heat and pressure to form the shape of products. Our products are handmade with the support by using machines ( compressing ) and hand tools to achieve the deep, rich and colourful finishes of lacquer. All items are both decorative and functional as well. With high skill, we are providing the good design and the best quality, suitable prices Home Decor products. Moreover, our company always focuses on a long-term realationship with the customers. Come with us, you will receive not only high quality products but also good service. We shall have responsibility to wrap goods by PE foam, then pack in the inner carton boxes, then put in master carton boxes. After we put in wooden cases. All the boxes are labeled in details outside. We supply you with exquisite selections and categories that include home and garden marble sculpture, decor and collectible statues, greek and roman busts, life-size statues, big statues, monumental statues, historic and religious statues, wildlife statues and antique finish marble statues, all of them have been made. We supply you with exquisite selections and categories that include home and garden marble sculpture, decor and collectible statues, greek and roman busts, life-size statues, big statues, monumental statues, historic and religious statues, wildlife statues and antique finish marble statues. We supply you with exquisite selections and categories that include home and garden Marble sculpture, decor and collectible statues, greek and roman busts, life-size Statues, big statues, monumental statues, historic and religious statues, wildlife Statues and antique finish marble statues, all of them have been made and offered from Chinastonework.Com, please contact us for more information and quotation.